Building materials company CSR has dismissed concerns about speculation in Australia's housing market, saying strong immigration and low interest rates still underpin the market. CSR shares rose more than five per cent after the company reported a 13 per cent increase in full-year profit, largely thanks to its key building products business. Managing director Rob Sindel painted a rosy picture of residential construction markets for the year ahead, saying CSR’s building products business had delivered record earnings as it increased its market share in the apartment and townhouse sector. “You’ve got a 350,000 increase in population, both through immigration and underlying population growth, so that’s the real driver for us,” Mr Sindel told reporters. Mr Sindel said he was not sure the housing market was “all driven by speculation”. “It’s a combination of low interest rates, low unemployment, better affordability and difficulties in the sharemarket,” he said. However, he acknowledged that apartment and townhouse approvals were flattening amid reports of bad debts and empty apartments relating to offshore property buyers. “The facts are they continue to sell and they continue to get built, so when that situation changes it may impact us, but you’re talking two years down the track,” he said. Mr Sindel said CSR was currently identifying “very stable” housing market indicators and record levels of residential construction activity would continue to support demand for the company’s building products in the next 12 months. CSR’s net profit of $142.3 million for the year ending March 31 compares to $125.5 million over the same period a year earlier, while revenue grew 14 per cent to $2.3 billion. The company’s profit after tax and before significant items also rose 13 per cent to $166 million – a result the company said was the best since the divestment of its sugar business in 2010. CSR said its financial position remains strong with net cash of $73.1 million underpinning the share buyback of up to $150 million launched in March. 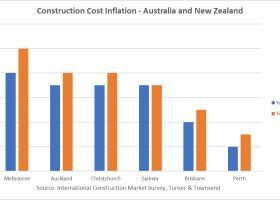 Whist there is definitely a strong pipeline of existing work which will keep activity in residential construction buoyant for now, it should be noted that forecasters are expecting a very significant downturn to kick in in a couple of years. Forecasters are not only saying that the sector will drop back to normal levels, but in fact there are risks weighted on the downside that indeed activity will fall back to below normal levels.